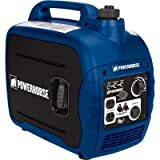 Powerhouse PH3100Ri 3100 Watt 6.8 HP 4-Stroke Gas Powered Portable Inverter Generator With Remote Start (CARB Compliant) was listed on Amazon for $1,299.00, selling for $1,220.28 USD brand new. Manufactured by The Coast Distribution System. There are 7 units left brand new. Powerhouse Products has combined quality, features and value in its new PH3100Ri inverter generator. The PH3100Ri has a 6.8 HP engine that provides the extra power needed to start a 13.5K RV air conditioner, while inverter technology makes it safe enough to power delicate electronic equipment. The engine can be set to run at variable speed for fuel economy as power demands or at constant speed for 100% full power. The PH3100Ri includes as standard features not included on most other leading brands of generators: a remote start to 75-feet, a built-in hour meter to track the total run time, and factory installed swivel wheels and pull handle for maximum maneuverability. Other standard features include an engine-reset button that will automatically restart the engine if the unit shuts down due to engine overload; one 5-20R 20 amp duplex receptacle; one L5-30R 30 amp twist lock receptacle; internal circuit breaker; fuel gauge, and emergency stop control. Continuous run time (hr) Full load; 7.6 hrs; 1/4 load; 17.8 hrs. EPA, CARB and CSA compliant. The PH3100Ri comes with an oil jug, 12V charge cable, spare spark plug, spark plug wrench & handle, oil drain extension, spare 10A glass tube fuse, user�s manual, keys and remote. Includes 2-year consumer warranty, 1-year commercial warranty.